Most people are familiar with mail headers such as From:, To:, Subject: etc. but there are many more which most people never see. Quite often we need to see the full internet mail headers from an e-mail that is causing problems. This article explains how to get hold of them in some of the more common e-mail clients. When viewing an opened message, click the Headers button, so that it is highlighted and shows Headers: Full. The contents of the top panel will change. Starting at the top-left, click and drag your mouse towards the bottom-right, to select all lines in the panel. You should then be able to copy the text. When viewing a message, click Options → Show Headers. The headers will show in a pop-up box - if you use an Internet browser like Firefox or Opera, you will be able to select and copy the text of this box. If you use Internet Explorer, you can select the box and press CTRL+C to copy its entire contents. When viewing a message, click the link Full headers. You should see the full internet headers in place of the usual display of To, From, Subject, Date. In older versions you may need to do it a different way - on the main menu bar, go to View → Headers → All and then select the relevant e-mail message. You should see the full internet headers in place of the usual display of Subject, From, Date, To. Double click the message to open it in a new window. On the menu bar of this window click View → Options and in the dialog box that comes up you'll see the mail headers listed in the Internet Headers text box. In the message list, right-click the message, and choose Message Options. 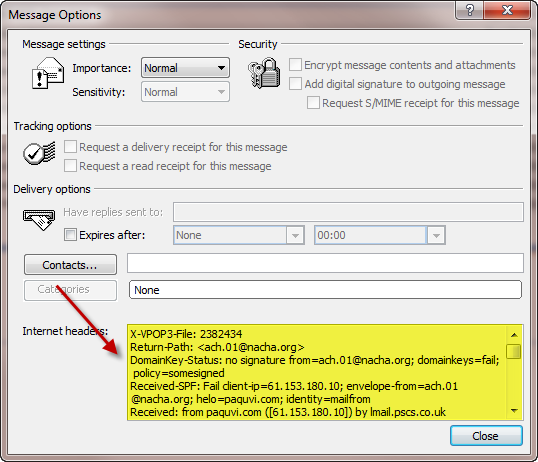 The message headers are shown in the Internet headers section, copy & paste those into the message to us. Double-click on the message in the list, to open it in its own window. Go to File → Properties. Select the Details tab. The headers are shown in the text box. When viewing your list of messages, right-click on the desired message and select View All Headers and Message. Alternatively once the message is open, you can right-click into the message itself and select View All Headers and Message. The full headers and message will display in place of the formatted message.